You may obtain this form (DL44) at any DMV office. Parent(s) or guardian(s) signature is required on this application. This form also requires your social security number. You may schedule an appointment through www.dmv.ca.gov or DMV telephone services 1-800-777-0133. You may access DMV Driver Handbook by visiting apps.dmv.ca.gov/pubs/dl600.pdf *We highly recommend that you read this handbook prior to taking your permit test. Choosing a professional driving school that provides quality services is vital towards paving your child's foundation for driving success. When researching different schools, here are some important questions to ask: How long has your driving school been established? How much experience do your instructors have? What percentage of your students pass the test on their first attempt? Another great source to find out information on driving school is word of mouth. Talk to friends, relatives or other parents before committing to a school. Although price is an important factor as a consumer, price should not be your determining factor in choosing a driving school. Check out our recommended driving schools for your area. Also, consider driving schools belonging to the Driving School Association of CA and Driving School Association of the Americas. If a police officer issues you a traffic citation, you may be eligible for traffic school. You must have the court's permission to attend. You may only attend traffic school to clear traffic infractions, 1 point convictions. You are eligible to attend traffic school once every 18 months. Parents should call their insurance agent to ensure that their child is covered with learner's permit. Most insurance companies require that the child be added to policy upon issuance of license. You are required to have an appointment to take the (written) permit test. The written test (for under 18 year) contains 46 questions, multiple choice. Passing is 8 errors or less. Alternate methods to take the written test include audio or oral test. You may take test in languages other than English. 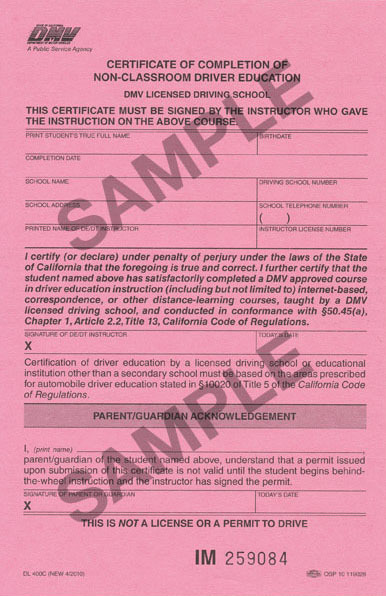 You will receive permit the same day that you pass the test. Permit is valid for one year from the date that you first applied. Permit is not valid until you complete your first driving lesson with a certified driving school or turn 17 1/2 years old. You are required to schedule an appointment for the drive test. Have your permit number available upon scheduling. You must provide the vehicle, current registration and proof of insurance. The vehicle must be in good working order. You will be tested on arm signals, equipment of the vehicle and safe driving practices. Are you prepared to pass the DMV written test? When the traffic signal lights are not functioning what should you do? Visit www.dmv.ca.gov/pubs/interactive/tdrive/exam.htm for more sample tests.